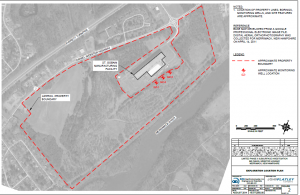 At the request of NHDES, Saint-Gobain sampled three monitoring wells that were previously installed on the property immediately adjacent to their facility (703 Daniel Webster Highway). The sample collected from one monitoring well, GZ-3, had a detection of PFOA at 19,000 parts per trillion (ppt, which is equivalent to nanograms per liter [ng/l]). This detection is the highest level of PFOA detected in groundwater around the Saint-Gobain facility, and suggests that a potential release has occurred in the vicinity of the monitoring well. Based on these results, additional work to assess the source of the release and characterize the vertical distribution of PFAS in the vicinity of GZ-3 is warranted, and NHDES requested this work be incorporated into the Site Investigation. This monitoring well will also be included in the quarterly sampling of the other monitoring wells at the facility to assess how concentrations are changing over time. A link to the data is here: http://www4.des.state.nh.us/IISProxy/IISProxy.dll?ContentId=4724405. Soils cuttings and purged groundwater, referred to as “Investigation Derived Wastes,” will be generated during the Site Investigation activities. These wastes will be containerized and moved to the Saint-Gobain facility property (for those materials generated at the abutting properties) pending off-site disposal. Saint-Gobain will be responsible for disposal of the waste materials in accordance with requirements applicable to the receiving site.